Ah Maine, land of wild blueberries and roaming moose. When blistering summer heat is wearing you down, the Pine Tree State promises perfect days and nights. Maine comes by the title “Vacationland” honestly, offering superior hiking, boating, antiquing, shopping, blueberrying, whale watching, and lobster eating. But how’s the birding? The Core Team was, as usual, game to find out. Sara, Mason, Ivy and I joined Seth and Chris, Ann and Bill, and a whole passel of Kentucky kin for a week-long vacation in the DownEast Acadia region. This was the same group with whom we stormed the Outer Banks two years ago, so we knew that good times were locked in. The crowd convened in Castine in a charming mansion called, in true understated New England style, the Northrop Cottage. Our accommodations were spectacular, our week absolutely fantastic. The birding, on the other hand, left something to be desired. 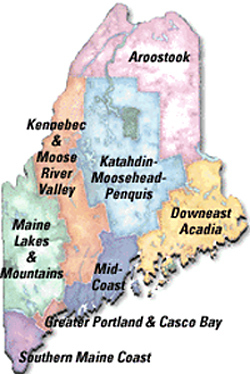 Maine has a reputation for being a bonanza for summer breeding birds, a haven for Eastern boreal species as well as migrants at the northern terminus of their travels. Yet the areas along the coast were remarkably, perhaps even disconcertingly silent. I’m used to the frenetic pace of New York avifauna where at least one bird is always in sight and several more working within earshot. In the parts of Maine I visited, on the other hand, one could watch the woods for ages without evidence of our fine feathered friends. Granted, with two young children, my attention was often split, but I’ve been at this long enough to rustle up a decent day list. I’m not sure to what I might attribute this astonishing lack of avians, but believe me, it wasn’t fun. Heck, I didn’t even spot a Common Loon until my last day there and loons are almost as symbolic of that state as moose are. Maine truly was the vacation paradise we imagined it to be. We all had a sensational time. The birding, however, wasn’t easy. I had to work a lot harder than usual to uncover even a handful of species at a time, something that definitely detracted from my sense of relaxation. This absence of avifauna was no doubt a coastal issue, one that wouldn’t rear its ugly head during a trip to, say, Bangor area. But summer visitors planning to bird the DownEast region or Acadia National Park should be aware that the birds in this part of Maine aren’t going to just fall out of the trees for tourists. Superb species can be found everywhere, but they may require more patience, persistence, perception, and passion than usual. Maine’s Great Black Hawk – Rescued!